A walking tour of Oranjestad Aruba reveals a town with a unique flavor, warm climate and colorful architecture. Oranjestad grew quietly around the Dutch Fort Zoutman in the late 1700s and has become one of the most popular tourist destinations in the Caribbean. The town received its name and its designation as Aruba’s capital when small amounts of gold were found on the island in the mid 19th century. To get a glimpse of Oranjestad’s history, visitors should check out Fort Zoutman, located just off the main thoroughfare downtown. Zoutman was originally built in 1796 to defend the island from pirates, and has served as a fort, aloe garden, courthouse, tax office and jail in its more than two centuries of existence. The Willem III tower, built in 1867, is a popular sight and the attached Historical Museum of Aruba offers visitors a survey of Aruba’s history and culture. City tours also depart regularly from this location and visit other tourist attractions. For those wishing to see more than the town’s history and architecture, Oranjestad is a brief drive away from some of the best beaches in the world. Aruba offers 13 distinct and well-maintained beaches ranging from large, public areas to quiet, private resorts, all of them boasting white sand beaches and clear water that makes for outstanding snorkeling and scuba diving. Recreational water sports are also available on several beaches, including surfing, jet skiing and windsurfing. Many hotels organize beach events and sports for visitors and guests to enjoy. Aruba is renowned for the quality and variety of its many restaurants, which draw from Dutch, Caribbean, Indonesian, Indian and South America culinary influences. Oranjestad is home to many of these establishments, each with its own unique flavor and atmosphere. Gostoso and Yemanja Wood Grill are among the most popular restaurants offering traditional Aruban cuisine, and Barefoot Restaurant and Marandi are top choices for couples seeking a quiet, romantic meal. As Aruba’s largest city, Oranjestad is also home to a wealth of shopping opportunities, including a number of duty-free selections. 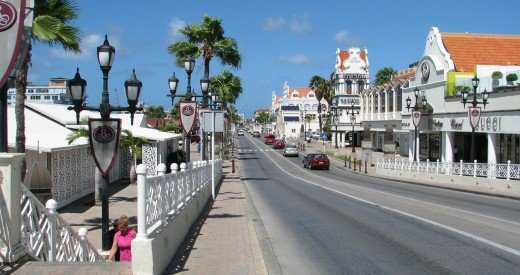 In fact, many visitors travel to Oranjestad almost exclusively for the shopping. The L.G. Smith Boulevard and Caya G.F. Betico Crowes are the two main thoroughfares in Oranjestad and boast shopping malls, marinas, restaurants and bars. The shopping and local flavor is by no means limited to these two streets, as street vendors, fishermen and local farmers can be found hawking their goods throughout the downtown area, especially around harbors and docks. Oranjestad is home to a huge number of hotels and bed and breakfasts, with a variety of settings and price options available. Paradise Beach Villas, Bushiri Beach Resort and Casa Del Mar all offer rooms for less than 100 dollars a night, and visitors looking for a more luxurious experience can check out the Tamarijn Aruba, Casa Cartagena Hotel and Spa, Marriott Renaissance or the Divi Aruba All-Inclusive. While there are dozens of hotels available in Oranjestad, be aware that many of these skew towards the 100-dollar plus range. Most large hotels are located on or near the beach, though the bed and breakfasts have a reputation for offering a warm, friendly atmosphere and intimate view of the island’s culture.